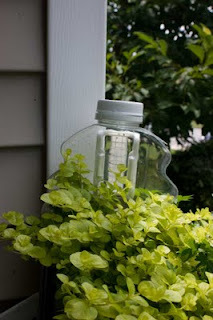 This week's challenge (which you can read HERE) asked us to get creative using repurposed items. It's something that we, in my family, do all the time. So ... in keeping with the challenge, I'm going to do a photo essay of some of our projects. I hope you enjoy them! A wine box gets a paint job and becomes a unique planter. A piece of scrap wallpaper is the canvas for this beautiful painting. 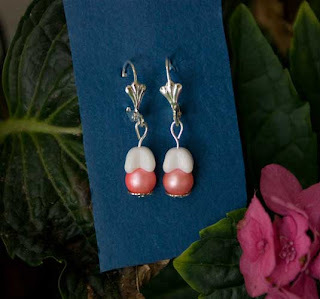 Found some broken jewelry and made new earrings. It once held juice ... then, in the winter, it became a terrarium ... home for a small cutting of Creeping Jenny which travelled, in my pocket, from Chicago. In the summer, we opened the side ... and Jenny "creeped" out. 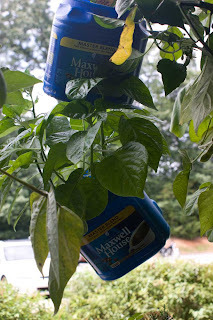 Coffee cans are now a home for Habanero peppers. 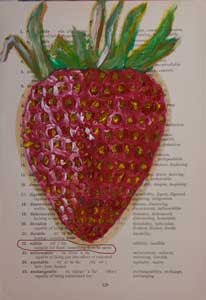 The pages of a recovered book became the canvas for this delicious strawberry. 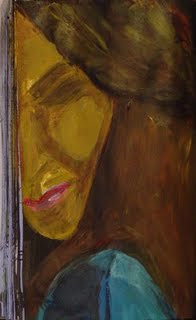 And Mona was painted on a homemade sketch book using a recycled cover from an old book and recovered blueprint paper. Isn't she lovely? I hope that these creations inspire you to look at common items, destined for a landfill, in a new way ... and possibly give them a new, interesting life. If you've ever gone out and pulled weeds from your yard or garden, then you know that they are tough. They send roots down to the center of the earth ... okay, maybe that's a little dramatic but ... it sure feels like it when I'm playing a tug-of-war with an ornery Dandelion. This quality, however, means that they are drawing nutrition from deep in the ground ... from an area that is rich in nutrients. I usually toss weeds and other plant materials into the compost bin which will create wonderful mulch for next year's garden. But what about this year's plants ... is there a way I could use those nutrient rich "greens" to help them? Sure ... make a liquid fertilizer ... a sort of "tea". And it couldn't be easier! Collect a bunch of weeds, leaves, herbs, grass clippings, etc. Each type of plant offers something different. For example, grass clippings provide nitrogen ... deep rooted comfrey donates a large amount of potash as well as magnesium, iron and calcium. So collect a variety of plant materials to ensure a well-balanced fertilizer. Find a container with a lid. This can be as large as you like, depending on the amount of fertilizer you'll need. Be sure to use a lid because as the "tea" matures, it will get smelly. Fill the container with the plant matter. Put the lid on and set the container in a warm spot. Shake the container every 3-4 days. If you're using a large container, give it a stir every few days. After about a month, the "tea" is ready to use. Strain out the solids and dilute (one part "tea" to two parts water). Doesn't that sound easy? Who knew that weeds could be such a good thing! When I was a kid, growing up in the Pacific Northwest, the only swimming pools available were the public variety found at community centers. From the moment I touched the water, at my first swimming lesson, I was in love with it. When I was eight, my family took a vacation to California ... I remember looking down from the airplane as we descended into Los Angeles, surprised to see built-in pools in backyards. Until then, the only pools in backyards that I had seen were the small, blow-up variety, with water that went up to a kid's ankles. Years later, I lived in Arizona and then Florida where backyard pools are a common occurrence. In fact, there are over 7 million backyard pools in America today. The apartment complex, where I now live, has two pools. The other day, while dangling my feet in one of them, I started thinking about the environmental impact of these recreational oasis's. There's the obvious impact ... they use a lot of water. But what about the not so obvious impacts ... the chemicals used to keep the water bacteria free and the electricity used to filter the water and heaters used to keep the water at the perfect temperature? And what about jets and spas? Install a cover. Did you know that that 30-50% of the water in a pool is lost to evaporation? A cover will save a lot of water. And, if the pool is heated, a cover will reduce the amount of energy required to keep the water at the perfect temperature by as much as 70%. Try a solar cover (also called a solar blanket) which absorbs the heat from the sun and transfers it to the water, reducing the need for a heater even further. To get the greatest benefit from pool covers, leave them on until right before the pool is to be used. And when swimming is over, put them back on. Covers keep the water cleaner, preventing leaves and other debris from falling in. An added benefit to pool covers is safety ... many covers prevent kids from falling in and some have security features such as locks. If a heater is a must, consider an environmentally friendly version. Try a solar heater. Turn down the temperature on the heater ... or better yet, turn it off. During hot weather, when most pools are used, there really isn't a need to heat a pool ... the sun will do a fine job. During cooler months, turn the heater down a few degrees. Just like the temperature inside a home, turning the thermostat down by even a few degrees will save a bunch of energy. Be sure the water filter has a timer and run it only during off-peak hours. And, run it only for 3-6 hours ... that's enough time to do the job. During the winter, cut it down to 2 hours. If a total cleaning becomes necessary, use an environmentally friendly cleaning service. Most companies will drain the pool, clean the walls with an acid base cleaner and then refill the pool. That's a lot of chemicals and a lot of water. A company in Arizona came up with a cleaning method that filters the pools contents and then pours the water back in! It takes less time and conserves a lot of water. Keep the pool's cleaning and heating equipment in good working order ... it'll be more efficient and use less energy. Keep the pool's water clean without using harmful chemicals. Consider non-toxic methods such as ionization. One note ... every method for keeping the water clean has it's environmental impact. So, learn about the various options and choose the one with the least impact. Of course, the most environmentally friendly pool is no pool ... but if you're going to have one, these steps will maximize your enjoyment while minimizing the environmental impact. Have you ever visited a site called Gaiatribe? How about The Wordsmith's Forge? Both sites are written by our bloggy friend, Elizabeth Barrette. Gaiatribe is a wonderful site. In it, Elizabeth talks about all kinds of things ... from getting a green job, to observing nature with our ears ... to a regular series called "Meet and Greet" where visitors get the opportunity to meet other bloggers and visit their sites. With Gaiatribe, Elizabeth shows us that everything in life has a "green" connection. In The Wordsmith's Forge, Elizabeth presents articles on just about everything. 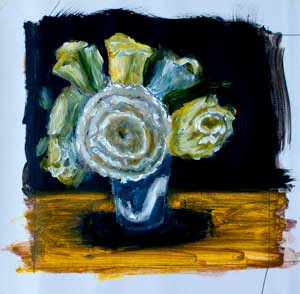 The subjects range from political commentary to environmental issues to the flora in her yard. Today is the first anniversary of Al Gore's challenge. On July 17, 2008 he challenged America to make a complete switch to clean, renewable energy in ten years. We now have nine years left to meet that challenge. If you are not already familiar with the terms of Gore's challenge, now is a good time to review it. View the original speech on video. "Al Gore lays down green challenge to America"
"Taking Al Gore's Challenge: A 10-Point Plan to Repower America"
We have now had a full year to begin implementation of Gore's challenge to make America's power 100% green. How are we doing? Are we 1/10 there yet? Several websites support Gore's challenge in particular or green energy in general, most notably Repower America, We Can Solve It, and Change.org. Based on statistics from 2007, the majority of America's energy comes from fossil fuels, mainly coal (48.5%) and natural gas (21.6%) while less than 10% comes from hydroelectric (5.8%) and other renewable (2.5%) sources. More organizations and companies are pushing the "green energy = green jobs" movement. This can help pull the economy out of its slump. Recently, the House passed a climate change bill which makes some improvements (encouraging renewable energy and raising standards for building efficiency) but has grave flaws (including giveaways to polluters and long delays). Al Gore supported this bill. So, we are not 1/10 of the way to a green America, but we are making some progress. There are many things still to be done. We need to be more careful about special-interest groups that sabotage efforts toward renewable energy, especially when they add years of delay to projects. We need to network more and connect interested people to build larger projects. Search for a green job. Join large activist networks and support green legislation, such as the Care2 Petition Site. Read green blogs to connect with other people. Visit the Gore's Challenge community on LiveJournal. Write about Gore's challenge in your blog; talk about the things you have done toward this goal and ask others what they are doing. We have also started using reusable shopping bags. This reduces demand for plastics made from petroleum. We are paying more attention to our food miles. Growing food, trading with gardener friends, and shopping at farmer's markets all help lower the use of gasoline for food transport. What are some things that you have done, or plan to do, to move towards sustainable energy? I'd like to say a huge thank you to Elizabeth for this wonderful, informative article. Junk Mail, Catalogs and Phone Books ... Oh My! Last year, in an effort to reduce the amount of paper in the world, I started a campaign to eliminate junk mail and catalogs from my mailbox and discontinue the delivery of phone books to my home. While I did enjoy, to some extent, browsing through those advertisements ... and while the phone books actually worked great as door stops ... I really didn't need them. And I got to thinking ... if everyone was receiving the quantity that I was receiving ... and eventually sending it all to the landfill ... well, that's a lot of trees being cut down (for nothing) and a lot of waste. So ... it had to end. Today, about a year later, my mailbox is free of clutter and my doorstep hasn't been graced with a stack of phone books in months. Yay! More importantly, paper has been reduced, trees have been saved and the landfill hasn't been filled with paper from my house. Imagine if every home in America ... or the world ... could say the same. Wow! DirectMail.com. These are the people who send out advertising. Their philosophy is that it is expensive to send fliers, mail, etc. to people who aren't interested so they can save money by not wasting their efforts. Catalog Choice. I really like this site. When a catalog arrives, I log into this site, search for the catalog and opt out of receiving it. That's it ... real easy. As with the direct mail advertisers, many companies don't want to spend money sending out catalogs to people who don't want them. So Catalog Choice works with companies to easily offer an opt-out service. If a catalog or particular company isn't listed on their site, one can request that a catalog be included and the administrators of the site will contact the company and work with them to offer this service. Brilliant! Opt Out Prescreen. Did you know: Under the Fair Credit Reporting Act (FCRA), the Consumer Credit Reporting Companies are permitted to include your name on lists used by creditors or insurers to make firm offers of credit or insurance that are not initiated by you. That's why mailboxes fill up with those pesky "You are Pre-Approved" offers and why every insurance company in the world seems to think that you need their coverage. This site allows you to opt out of those kinds of offers. Yellow Page Goes Green. The purpose of this site is to get your name and mailing address off the delivery list. This is the site that I've had the least success with ... many phone books are just bundled up and dropped at the door. Also, there are a bunch of companies who print and deliver "phone books" in my area ... and not all of them are covered by this site. By all means, sign up on this site ... it will eliminate some books. Beyond that, whenever a book is delivered, check it for the providers name and phone number and then call them ... they'll take you off the list. Calling has worked the best for me ... I no longer get phone books. National Do Not Call Registry. When you sign up on this site, you'll be amazed at how many telemarketer calls will be eliminated. If one should get through, ask them to place your number on the "Do Not Call" list ... which, by the way, is different from asking them to take you off their call list (which won't accomplish anything). So ... visit a few sites, make a few calls ... eliminate paper waste. It's a good thing! Awhile back I gave up chlorine bleach. Yes, it cleans and disinfects ... and makes our whites whiter. But, there is some evidence that it is harmful to our health and the health of the environment. The evidence is mixed, however ... some reports say that it is totally safe and will break down into natural components when it reaches the ground or waterways. Other reports say that it is lethal to fish and pollutes our natural resources ... and is a health hazard to humans. What I know, for sure, about using chlorine bleach is that it smells bad and gives me a headache. So, I tend to lean towards the people who say bleach is toxic. If there is even a hint of something being harmful, especially when there are alternatives, then ... I'm all for "erring on the safe side" and choosing the healthier version. One of the healthier alternatives is hydrogen peroxide ... the cheap stuff that comes in a brown bottle and is available almost everywhere. It doesn't smell ... it doesn't hurt the environment and ... it works. The U.S. Environmental Protection Agency has approved hydrogen peroxide as a sanitizer. So, use it to kill germs on all surfaces (counter tops, tables, showers, etc.). It can be applied to a sponge or cleaning rag for wiping down an area ... or sprayed directly onto the surface. Do you use a wooden cutting board or wooden utensils? A little peroxide will kill salmonella and other harmful bacteria. Add one cup of peroxide to a load of whites in your laundry to whiten them. The trick with making this tip work is time. Peroxide takes time to work so ... add it into the wash and let it sit for awhile (I let mine soak for at least an hour). Then, add in your regular detergent and wash as usual. Use it to wash store-bought fruits and veggies. According to the Journal of Food and Science, peroxide is affective in killing E.coli. Fight mold and mildew throughout your home ... just spray peroxide onto the affected area and let it sit ... then wipe down as usual. Apply it to a clean rag to shine up mirrors and windows. Use it to mop your floors ... either add it to your bucket of water or ... pour it directly onto the floor. It is rendered useless when exposed to light (that's why it comes in those brown bottles). So, if you want to keep a spray bottle handy, be sure it is a dark spray bottle. It takes time to work, so spray or pour it on and then let it sit. Peroxide is a bleach and will whiten ... so be careful when applying it. If you're trying to get a stain out of, for example, your blue jeans and you pour peroxide directly onto the material ... you'll probably end up with a white spot. So, use caution. Some reports have suggested using peroxide as a mouthwash to clean and whiten teeth. It should be noted that there is some evidence suggesting that peroxide can be used in the treatment of mouth infections but that long-term use can damage tissues in the mouth. So, ask your doctor before using peroxide in this way. So, there you have it! A cleaner that works ... and is kind to both humans and the environment. How good is that!! This past weekend, the U.S. celebrated the 4th of July ... our Independence Day. There were all kinds of activities going on ... speeches, concerts, festivals ... all designed to renew our sense of patriotism and pride. Many of the festivities included recognition of those who serve in our military and those who volunteer their time to make our world a better place. And ... an appeal went out to all of us to do our part. What is patriotic? Fighting for one’s country is patriotic, flag-waving is patriotic, singing “The Star-Spangled Banner” is patriotic. Now, let’s think outside the bin (sorry, recycling humor) to something you do everyday. That’s right. Every time you reduce, reuse and recycle you’re celebrating your love for your country. During World War II citizens were urged to recycle (or “salvage”) metal, rubber, paper and even kitchen fat to help in the war effort. Today’s soldiers don’t need recycled steel for guns, salvaged kitchen fat for explosives or scrap paper for packaging, but recycling is still patriotic. By recycling, we show our love for our country by protecting our nation’s resources, reducing our dependence on the resources of other countries and boosting our economy. Recycling plastic reduces the need for virgin plastic. Of course, virgin plastic isn’t a natural resource, but the petroleum used to make it is. In fact, approximately 4% of our annual oil consumption is used to make plastics. By recycling more plastic we reduce the need for the production of virgin plastic and that reduces our dependence on foreign oil. Manufacturing products using recycled materials instead of virgin materials requires a lot less energy. Making an aluminum can from recycled aluminum requires 95% less energy than making an aluminum can from virgin aluminum. In 2003, we reduced our oil usage by more than 15 million barrels by recycling 54 billion aluminum cans. Of course, oil isn’t our only source of energy. 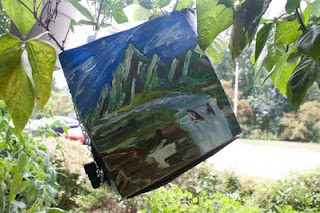 Recycling materials also reduces our need for coal—and that protects those purple mountains majesty. Using less energy also saves money. Saving money improves the national economy, but the recycling industry has given the national economy a real boost by creating over a million jobs. In fact, a recent report by the Pew Charitable Trusts found that jobs in conservation and pollution mitigation (including the recycling industry) make up 65% of the United States’ clean energy economy. Recycling reduces the amount of solid waste we need to dump in landfills, which in turn, reduces the need for landfills. By protecting our land from being “filled” with garbage, we’re helping to keep America beautiful. Recycling paper protects our forests by reducing the need for trees to produce paper. Recycling cars and other objects made of steel and iron reduces the amount of iron ore we must mine and recycling aluminum reduces the amount of aluminum we have to pull out of the ground. There you have it. You love your country. You just have a different way of showing it. Now, gather your friends and family and enjoy your 4th of July barbecue. Don’t forget to grab your recycled (and recyclable) plates and your recycled American flag. So, the next time you recycle something, feel proud ... and patriotic! Thanks to RecycleBank for this wonderful article. When we were at our farmer's market last week, it seemed that every booth had kale ... which I adore. 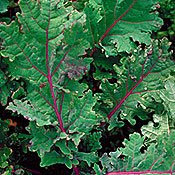 A particular bunch of Red Russian Kale drew my attention ... it was so beautiful with it's purplish, red ribs. So, of course, I had to have some. Kale is so healthy, with it's antioxidant and anti-inflammatory properties. It is high in fiber, beta carotene, vitamin K, vitamin C, lutein, zeaxanthin and calcium. It also contains sulforaphane, which is believed to have potent anti-cancer properties, particularly when chopped or minced. In the vegetable world, kale is a nutritional powerhouse! Nutrition aside ... I just think it tastes good. Clean kale and remove ribs. Coat a wok or skillet with nonstick cooking spray. Heat on medium-high. Add kale and onions. Stir for 1 to 2 minutes. Add rice vinegar, soy sauce and sugar. Reduce to medium and stir until kale and onions are crisp-tender.